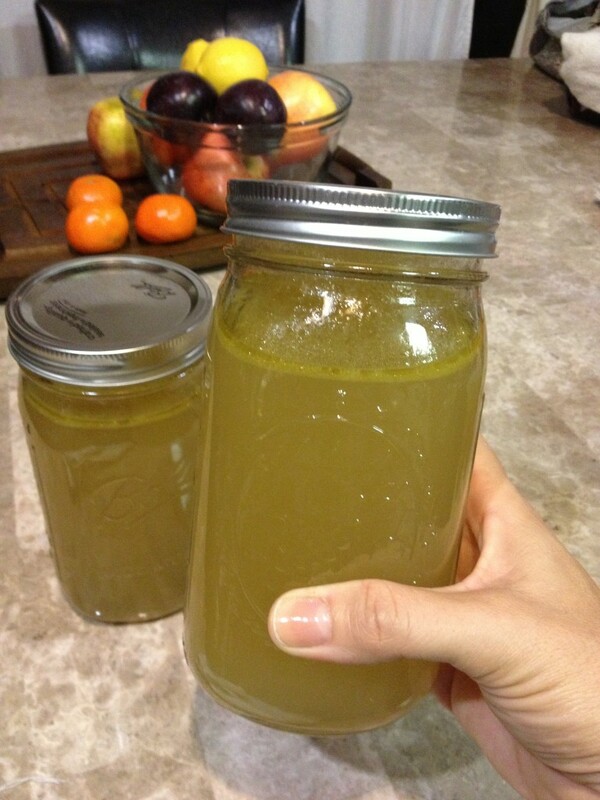 Bone broth is loaded with natural vitamins, minerals, collagen, glucosamine and gelatin. Its benefits are so vast that it is really a miracle food and should be a staple in every household. If you are a strict vegetarian, Potassium Broth is a close second to Bone Broth but doesn’t quite have all the same benefits. Bone Broth is alkalizing, super hydrating, aids digestion, helps heal leaky gut, is extremely anti-inflammatory, supports bone and joint health, supports kidney and adrenal function, is a super food for your hair, nails and skin and is a fantastic immune booster. It’s simplest form is made with FOUR staple ingredients – bones (poultry or beef), onions, celery, and potato peels – tossed in a pot and covered with water, brought to a boil and simmered for at least 2 hours. But you can add whatever veggies you have on hand and a little sea salt for a fuller, richer flavor. I make couple batches of Bone Broth or Potassium Broth every couple weeks. I keep what I will use during the week in the fridge and freeze the rest to use the following week. I suggest to always using organic bones when possible – and if you are going to splurge on organic, this is a great way to get the most out of your purchase. If you are not ready to make a stock that night after dinner simply toss your bones into a freezer bag and freeze them – they will be ready for you whenever you are ready. You can also use any veggies that may be close to spoiling. If you are ever pressed for time and do not want to have to tend to a pot on the stove for hours, you can put all the ingredients in a crock pot and let cook on low over night and strain in the morning. Toss all bones and veggies into a large stock pot and fill pot with water. Bring to a boil and then lower the heat and simmer for at least 2 hours. The longer it simmers the fuller the flavor. You can add additional water as needed while your broth simmers. When you are ready, remove from heat, strain out the veggies and season with sea salt to taste. Store in the fridge if you will use it within the week or freeze for longer storage. 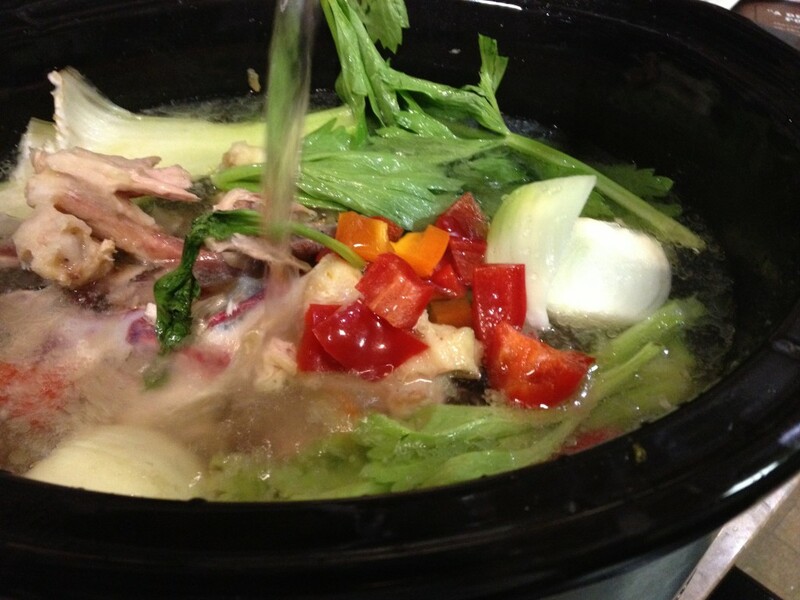 *** In the crock pot – Toss all your ingredients into your crock pot and cook on low for 8 – 12 hours. I like to set the crock pot up after dinner – especially after a roast chicken dinner – and let it cook all night and then strain it in the morning.